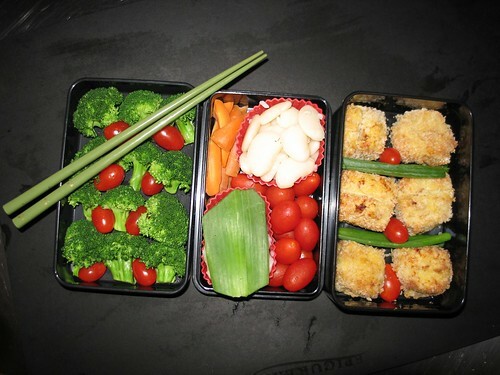 If you aren't away from home at lunchtime, there really is no reason for bento. I have to say that I eat a much healthier, lighter and prettier lunch on workdays than on home days. There's something very important about the box itself--the frame, the limiter, the small canvas--that just doesn't translate to the plate at the home table. That's interesting, about the importance of the box: I had already got the sense that it does a lot more than look pretty, and provide a degree of ritual. And yes, I always eat at home, so I have no reason to bento. Some days I invest time and effort into making a pretty lunch (which yes, is likely to be lighter and healthier), but mostly I'm all about leftovers.